Pasig City (7 December) -- Lubang Island in Occidental Mindoro hugged the headlines in the 70's as the last stand of Japanese straggler Lt. Hiroo Onoda before surrendering to Filipino authorities not knowing that World War II has long ended. Fast forward to 2010, Lubang will once again be put to national prominence as the pilot site of the One Laptop Per Child (OLPC) project ? the first formal classroom deployment in South East Asia. A brainchild of Lubang Mayor Juan Sanchez, the project aims to increase educational opportunities for the school children of Lubang Central School by providing them with an initial 100 units of XO laptops and means to learn and become digitally literate. The project was put together by past and current employees of the National Computer Center (NCC), an organization founded by Sanchez. Education Kindling (E-Kindling), a non-stock, non-profit organization, collaborated with NCC for the deployment and program design of this education project which will initially benefit 95 Grade 4 students of Lubang Integrated School and Maligaya Elementary School. Twelve more units are on stand-by in case of unit breakdown. 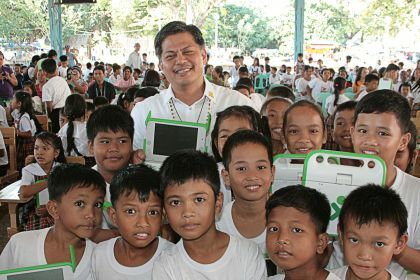 Education Secretary Armin Luistro said the school children of Lubang, though not lacking in their capacity to learn, do not have the same opportunity as their city counterparts to acquire their own personal computers. "For us at DepEd this initiative of NCC staff equalizes the learning opportunity of learners in urban centers and those in remote areas," Luistro added. Sanchez said the OLPC project was chosen over the option to just donate personal computers to schools because support infrastructure is available locally, internationally and online, for both hardware and software. The technology is appropriate for remote areas. The laptop is sturdy, requires low power usage and is easy to maintain. Moreover, it uses free and open source software which can be customized in the field. "These advantages make OLPC an ideal approach for implementing computer based learning in a country like the Philippines or Lubang for that matter. If you are in an isolated place like Lubang, the only way to go is through technology. If you don't do anything innovative, maiiwanan ka talaga" Sanchez explained. Based on the agreement, each child in the pilot class will be provided with a laptop for use in and/or out of classroom. The school which has the ownership of the laptops will develop its own policies and guidelines in the distribution and usage of the laptop. The school curriculum/lesson plan will soon be integrated in the content. The content development for the Lubang pilot school will be part of the project. The XO laptop is designed for the use of children ages 6 to 12-covering the years of elementary school-but nothing precludes its use earlier or later in life. The XO has been designed to provide the most engaging wireless network available. The laptops are connected to each other, even when they are off. If one laptop is connected to the Internet, the others will follow to the web. Children can be permanently connected to chat, share information on the web (if provided with internet access), gather by videoconference, make music together, edit texts, read e-books and enjoy the use of collaborative games online. This project was conceived during the planning of the NCC reunion held in Sydney in September 2009. The intent was to give deeper meaning to a reunion of former and current employees of NCC by sponsoring a community service that would demonstrate the NCC spirit of innovation, excellence and service for others. This is in keeping with NCC pioneering IT education in the Philippines led by Sanchez whose vision is to convert Lubang into a technology island. Lubang was chosen as the pilot site of the OLPC project because it has shown readiness in terms of education infrastructure and achievement indicators. Sanchez said Lubang has achieved 98% enrolment rate in elementary and high school and that there were no reports of drop outs and absenteeism. It also boasts of 1 is to 30 teacher to pupil ratio. According to Sanchez, 80% of Lubang's public schools are brand new but he hastened to add that:" We do not just build schools, we build a better future for our children and the municipality." With the help of the private sector, Sanchez hopes to raise P1.5M donation each year to complete the pilot program by 2012. Funding for the initial 100 XO laptop units came from donations from former and current employees of NCC. Upon success of the pilot test, the rest of the schools of about 400 students will be funded from other sources. Lubang Integrated School and Maligaya Elementary School will be the first OLPC pilot area in the Philippines and the first formal classroom deployment in Southeast Asia with the most number of laptops distributed. Malaysia and Thailand are also in start-up stage. Learning workshops and collaborative curriculum integration will be organized with Education Kindling (eKindling). Training facilities are being arranged with Commission on Information and Communications Technology, the University of the Philippines, and Asia Pacific College. Luistro stressed that the workshops will train the teachers on the use of XO laptop for effective learning, student facilitation and administration; hardware maintenance; and ways and means of obtaining learning software and content. The OLPC program is an initiative started in 2002 by Nicholas Negroponte of MIT (Massachusetts Institute of Technology) to create educational opportunities by providing a child with a rugged, low-cost, low-power, connected laptop (called the XO) with content and software designed for collaborative, joyful, self-empowered learning. When children have access to this type of tool they get engaged in their own education. They learn, share, create, and collaborate. "By giving children their very own connected XO laptop, we are giving them a window to the outside world, access to vast amounts of information, a way to connect with each other, and a springboard into their future," Sanchez shared. "It's not a laptop project. It's an education project," Sanchez expounded. To be able to start a nationwide deployment of the OLPC program, it needs to first develop and test a deployment model that can be used in implementing this in the entire country. The school pilot will simulate the same type of conditions that the school, teachers and students will undergo to use the XO. Once a successful model has been identified, this will be used as a model for replication in other schools all over the country.